Concrete is a quite trendy store in Amsterdam, NL that sells clothes, toyz as well as designers' accessories. 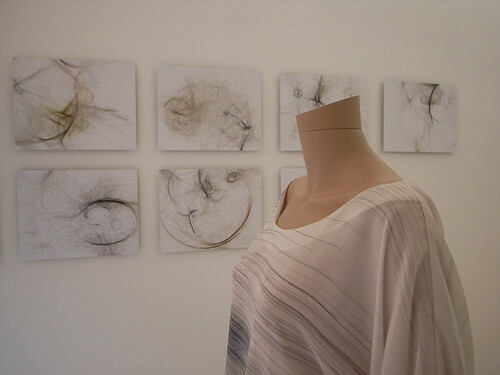 Yesterday, it proposed some work by Casey Reas (viz/image design) and Cait Reas (dresses). Why do I blog this? what was intriguing there was the presence of the book "Processing: A Programming Handbook for Visual Designers and Artists" (Casey Reas, Ben Fry) that is, essentially, the bible to employ this programming language, which allowed the design of the viz on the wall and the dress such as the one represented on the picture above. Physical-to-digital-to-physical translation.